Modern luxury amongst the tall gums with stunning views to complete the experience is all on show at Black Mamba House. 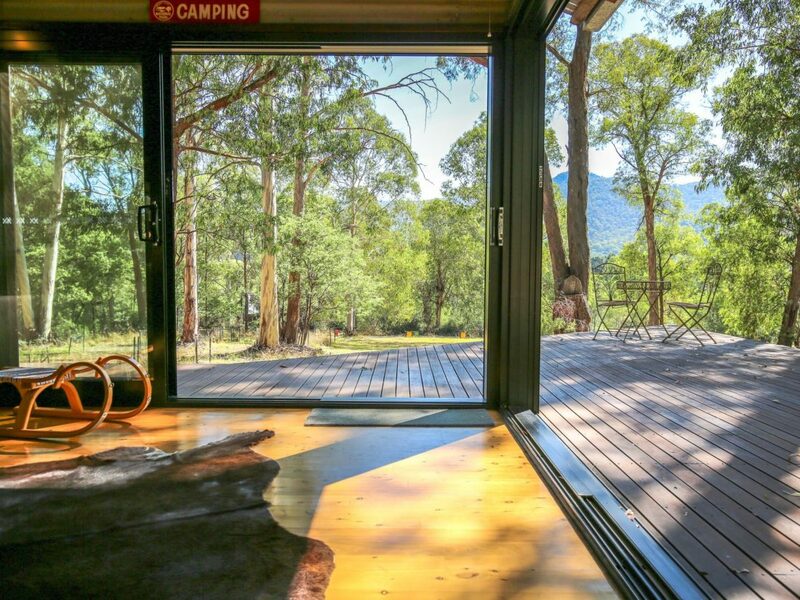 This uniquely stylish loft nestled in native bush land seamlessly fits into the landscape offering escapism and serenity – a short walk to town. Set over two designer ‘pods’, Black Mamba House can sleep two couples in spacious style or offer a choice of experiences to one lucky couple. Slide open the stacking floor to ceiling doors to let the fresh Alpine air in. Unwind on the deck or stretch out on the comfy couch with a good book and the afternoon sun streaming in. A stroll down to Tronoh Lake may be your perfect day. The gorgeous wood fire sets the tone for the cosiest winter nights after a long day on the slopes while the reverse cycle heating and cooling means you can relax in true comfort year round, with a good movie or inspired catch-ups. Your fully equipped kitchen, complete with automatic coffee machine allows for the perfect breakfast in bed or romantic dinner for two. Barbecue under the gums in true Alpine style or enjoy fantastic pubs and cafes just a walk down the hill. Uur unique & cosy master bedroom accessed via a tall locally handcrafted steel ladder, is a space like you’ve never experienced before. The comfiest queen bed perched high to bring you closer to the Alpine stars through your perfectly positioned windows, with a clever design makes you feel you are part of the natural surrounds. For those able to climb & descend the long ladder, this is a truly special place to be. For those not so comfortable with heights or climbs, an equally special 2nd pod also with a comfy king bed offers ground level delight. Also perfect for older children, the views from your bedroom pod are as amazing the main house. Slide open your stacking doors and sleep under the stars or curl up on the high nook with your favourite book or maybe just some peace & privacy. Your own gorgeous half bathroom oozes rustic style.